And here’s a perfect example why this is important. 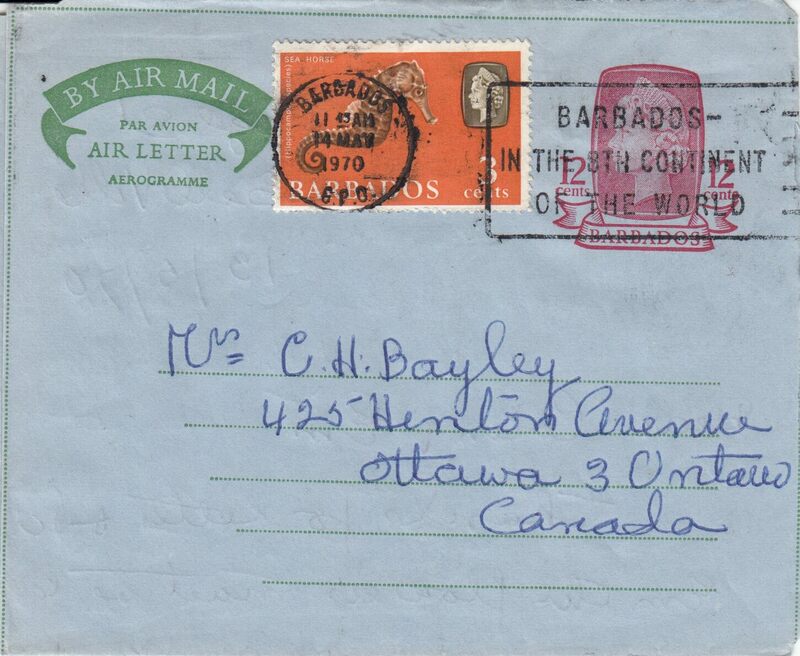 The ‘Bible’ of Barbados cancels is “Barbados Post Office Markings to 1981” by Clarke, Radford and Cave. In it, they list pretty much every cancel that was ever issued and used on Barbados, with notes on the earliest known date (EKD) and latest known date (LKD) of each of their uses. Of the twenty three known ‘slogan’ cancels’ there are some which are harder to find than others. When I saw this uprated 12c aerogramme recently for sale I knew I had to buy it immediately as despite a lot of searching, I had never found one with a “BARBADOS – IN THE 8TH CONTINENT OF THE WORLD” cancel on it. Within the book, they list the EKD of this particular cancel as being 22nd May 1970 but a closer inspection of the postmark reveals that this one was posted and cancelled on 14th May 1970, a fact confirmed by the date written inside the air letter. Of equal interest is that it was written by the wife of a prominent philatelist to the wife of another prominent philatelist but the letter makes no mention at all of philately! So, is this a discovery piece? I’m not sure as since the publication of “Barbados Post Office Markings to 1981” in 1982 there have been no updates, but I’m sure there must be other finds over the intervening 35 years. Do you have anything like this in your collection and is it an earlier date? Or, do you have one later than the LKD of 14th October 1970? Feel free to comment below if you can add to this story.